Universal Orlando Resort and Warner Bros. will host its third annual “A Celebration of Harry Potter,” a special gathering of Harry Potter fans from around the globe, Jan. 29-31, 2016. The three-day weekend event will feature an array of experiences. Additionally, guests will be able to visit The Wizarding World of Harry Potter Hogsmeade at Universal’s Islands of Adventure and The Wizarding World of Harry Potter Diagon Alley at Universal Studios Florida, and ride the Hogwarts Express between the two lands with a park-to-park ticket. Special vacation packages, including annual passholder packages, will go on sale at noon EST on August 19. On-site hotel packages start at $235 per adult per night and include exclusive benefits such as special guest access to “A Celebration of Harry Potter ” Expo, admission to a private evening reception in The Wizarding World of Harry Potter and special guest access to panels and demonstrations. Packages also include three-night hotel accommodations, three-day park-to-park tickets to both Universal Studios Florida & Universal’s Islands of Adventure, a special welcome parcel and more. For complete package details, visit www.universalorlando.com/celebration. Universal Orlando’s two theme parks, Universal Studios Florida and Universal’s Islands of Adventure, are home to some of the world’s most exciting and innovative attractions. Its on-site resort hotels, Loews Portofino Bay Hotel, the Hard Rock Hotel, Loews Royal Pacific Resort, and Universals Cabana Bay Beach Resort are destinations unto themselves. Its entertainment complex, Universal CityWalk, offers dining and entertainment for every member of the family. And just minutes away is Wet n Wild, a family water park. Universal Orlando Resort has unveiled 18 new guest experiences in the past five years including new attractions, dining opportunities and a dramatically themed hotel. And more is on the way. Coming in 2016 is Universal Orlando’s fifth on-site hotel, Loews Sapphire Falls Resort; and Skull Island: Reign of Kong, a groundbreaking attraction in Islands of Adventure. And in 2017, Universal Orlando Resort will open Universal’s Volcano Bay, an entirely new water theme park experience. Universal Orlando Resort is part of NBCUniversal, a Comcast company. Follow on Facebook, Twitter, Instagram and YouTube. Universal Orlando Resort just announced that special vacation packages will go on sale Sunday, July 31st that will give guests the opportunity to attend “A Celebration of the Harry Potter Films.” © 2011 Karen Rubin/news-photos-features.com. Universal Orlando Resort just announced that special vacation packages will go on sale Sunday, July 31st that will give guests the opportunity to attend “A Celebration of the Harry Potter Films.” This special event will be hosted by Warner Bros. and will celebrate a decade of movie history by allowing fans to share their love for the Harry Potter films. The event will take place from Friday, November 11, to Sunday, November 13, at Universal’s Islands of Adventure, home to The Wizarding World of Harry Potter. Screenings of all eight Harry Potter films – including “Harry Potter and the Deathly Hallows – Part 2” – at the AMC Universal Cineplex 20 in Universal CityWalk. Access to the screenings can be added to the vacation packages for an additional fee. Throughout the three-day celebration, guests will also be able to explore The Wizarding World of Harry Potter, where the wonder, excitement and adventure of the Harry Potter films come to life. 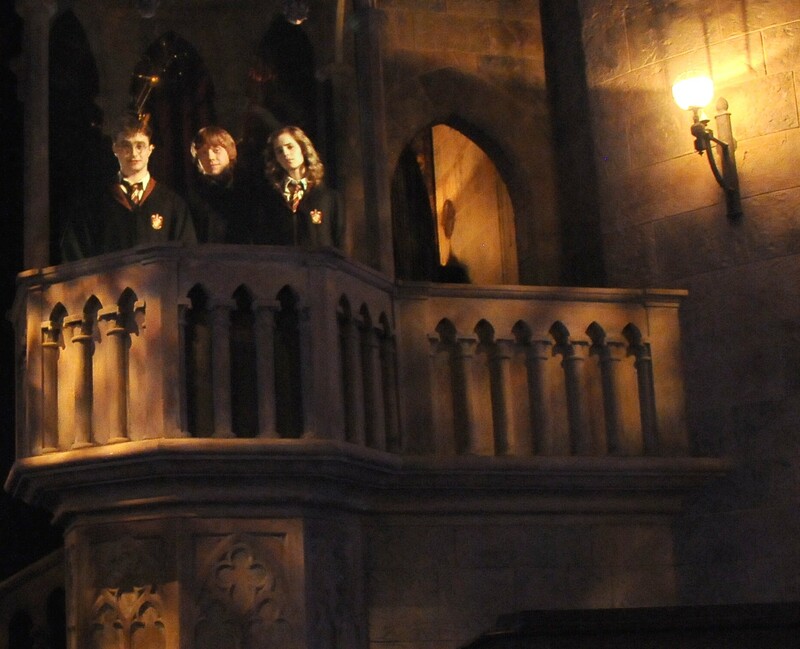 They will enjoy experiences such as soaring above Hogwarts on Harry Potter and the Forbidden Journey, sipping Butterbeer in Hogsmeade and being inside Ollivanders and seeing a wand choose its wizard. The primary way to participate in celebration events is by purchasing one of Universal Orlando’s special vacation packages. Packages are extremely limited and go on sale at noon EDT on Sunday, July 31. Guests can choose from two vacation package options: the Celebration Vacation Package and the Premier Vacation Package. There will be additional ways for a limited number of people to participate in celebration events. Stay tuned for more details. For more information about the event and vacation packages, visit www.universalorlando.com/celebration. 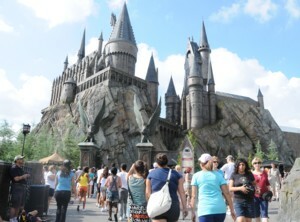 On Saturday, June 18, Universal Orlando celebrated the one-year anniversary of The Wizarding World of Harry Potter. To cap off the celebration, Universal launched a “Share Your Story” tab on its official Facebook page where guests can share their favorite memories – or the memories they hope to make – of the most spectacularly themed environment ever created © 2011 Karen Rubin/news-photos-features.com. On Saturday, June 18, Universal Orlando Resort celebrated the one-year anniversary of the most spectacularly themed entertainment environment – The Wizarding World of Harry Potter, where the wonder, excitement and adventures of the Harry Potter books and films come to life. Universal Orlando commemorated the anniversary at 9:23 a.m. – the exact time The Wizarding World of Harry Potter opened on June 18, 2010. After taking part in a countdown led by the Hogwarts Express conductor, guests and team members celebrated in the streets of Hogsmeade while “snow” confetti and gold streamers fell from the sky. Guests also enjoyed complimentary Butterbeer, cauldron cakes and Chocolate Frogs. Universal Orlando also created a virtual celebration by launching a new “Share Your Story” tab on its official Facebook page. The all-new tab gives fans the opportunity to interact with one another and share favorite memories and photos from their visit to The Wizarding World of Harry Potter – whether it’s tasting Butterbeer for the first time, watching their daughter as she’s selected by the perfect wand or soaring above Hogwarts with their family. Every U.S. resident who shares their story will automatically be entered to win a VIP trip to Universal Orlando Resort this fall. Now through July 15, Universal will give away two VIP trips each week – one to a guest who has experienced The Wizarding World of Harry Potter and one to someone that has never been. If fans have not been able to visit The Wizarding World of Harry Potter, they can share why they aspire to on the “Share Your Story” tab as well. U.S. residents who share their stories on the tab will be automatically entered into a contest where they can win a trip to Universal Orlando Resort this fall. To take part in the virtual celebration, share their stories or read other fans’ stories, guests should visit www.Facebook.com/UniversalOrlandoResort. Inspired by J.K. Rowling’s compelling stories and characters, The Wizarding World of Harry Potter features multiple themed attractions, shops and a restaurant – all faithful to the films. For more information about The Wizarding World of Harry Potter and Universal Orlando Resort, visit www.universalorlando.com.